SKU: 76401 06 Sd. Categories: Ashley, Recliners. Tag: 764. DuraBlend®/Match upholstery features DuraBlend® upholstery in the seating areas with skillfully matched Polyurethane everywhere else. 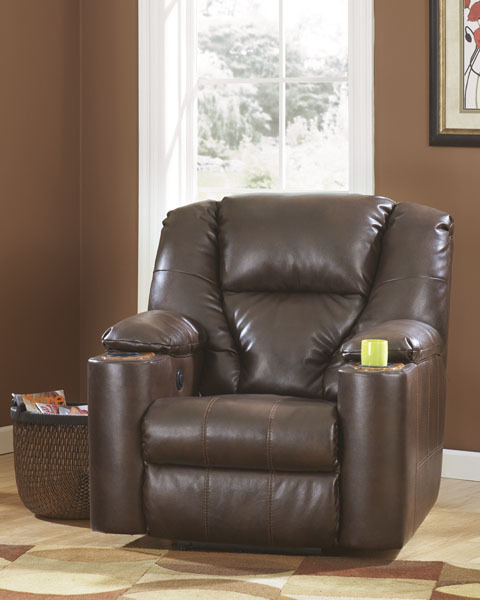 If you’re looking to create an exciting and comfortable living area that is sure to grab everybody’s attention, look no further than “Paramount DuraBlend®-Brindle” home theater seating recliner. With the rich DuraBlend® upholstery stylishly adorned with exciting stitched details wrapped beautifully around a contemporary designed recliner with padded arms and cup holders, this home theater recliner creates both style and function perfect for any decor. Series Features: Frame constructions have been tested with various equipment to simulate the home and transportation environments to insure durability. Corners are glued, blocked and stapled. Stripes and patterns are match cut. All fabrics are pre-approved for wearability and durability against AHFA standards. Cushion cores are constructed of low melt fiber wrapped over high quality foam. Features metal drop-in unitized seat box for strength and durability. All metal construction to the floor for strength and durability. The reclining mechanism features infinite positions for comfort. Also available in power.